The only reason to not rate this excursion 5 stars is that there is quite a bit of waiting around for activities to start. Had an wonderful time!! Lots of fun snorkeling. The stingrays and sharks were amazing. Alex is the best tour guide ever. See you again very soon. People was very nice and funny. The view from the parasailing was amazing. The sharks were pretty scary, but we recommend de tour anyways. I highly recommend the tour! We went Parasailing and the view was beautiful, then we went snorkeling and Alex Santana was great! He show us all the corrals and fish in the sea. The whole crew was really nice and make of our trip super nice. I really enjoyed this tour, I had such a great time. The staff made sure we were entertained the entire time. 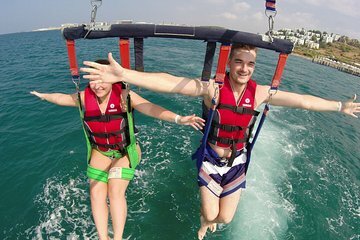 The only recommendations is that they provide a photographer for the parasailing activity. My fiancée and I picked this tour specifically because it was not one of the 100s of party tours and we werent disappointed. Our fellow travellers were lovely and interested in having a good time rather than just drink. Robert and the rest of the crew were fantastic hosts and made sure we enjoyed ourselves. This was my first time parasailing and I loved it. The snorkelling was fun and I saw a few beautiful fish. Our time with the stingray and sharks was a highlight of our trip and we would recommend. The only disappointment was with the natural pool which when compared to others seen online was a definite disappointment. Our ride home was late to pick us up but this was no ones fault and the crew stayed with us to make sure we got home safely. I highly recommend this excursion! The people were friendly and welcoming. Staff was very accommodating and go through great lengths to ensure your having a great time. Alex was my favorite!! Everything from the music, drinks, snacks, and entertainment was AMAZING!!! This was a great adventure for me and my wife. My wife was scared of parasailing but they made sure she was comfortable and the ride was smooth. The stingrays and sharks were amazing and friendly. If you want to swim with sharks this is the best place to do it and get a feel for other adventurous things. We had a great time and the staff were very knowledgeable and made sure everyone was safe and having fun. If your in Punta Cana this is a must!!!! The tour was awesome. Alex took great pictures and we suggest purchasing them. Dance party on the boat with unlimited drinks. Highly recommend! Sharks and stingrays were really cool. Parasailing was fun but the guys running it didn't speak any English and were very short with everyone.